If your kids are anything like mine, they are not big fans of organizing. In fact, they will do just about anything to avoid organizing or cleaning their room! Once the room is tidy they always have so much more fun playing in it, and ultimately making it messy again. Now as parents, accepting that your kid’s room will never be TOTALLY clean or STAY totally clean can (hopefully) relieve some of your stress. Some simple tools and planning can really help provide a method to the madness of toys, stuffed animals, kiddo clothes, and painful-to-step-on Legos. With some practical, easy-to-learn organizational techniques (and some deep breathing), you can realize the dream and get your kid to keep their own room organized! If you are struggling to make storage, organization, and cleaning fun, take a tip from Mary Poppins and try to combine it with play! One of my daughter’s favorite games is tea party, which involves getting out all her stuffed animals, toy food, and dishes. When she is done serving tea, she loves to arrange all her toy food and dishes inside of her Fisher Price refrigerator. She has fun doing it and (please don’t tell her this) is actually organizing her room! All her stuffed animals used to live on her bed which was super cute and cozy. The downside was every night when she got in bed every stuffed animal would go on the floor. Then it would turn into a fight about who picked them up, where did they belong on the bed, how long it took to put them away, everything! We were both tired of it to say the least. Our solution was to get something to store just the stuffed animals in. She choose an enormous pink plastic bucket and ever since we got it that is where her animals have lived. No stress, no fuss, and they are still all within reach of the bed. Letting your child have a say in how they are storing their things makes a huge difference. I let my daughter pick out her container to store her stuffed animals and she even choose a few other organizers for her art supplies and barbies. The fact that she got to make a choice about her room and storage made her feel like such a big kid, she was proud to use them and fill them with her belongings! Another easy way to make tidying easier for kids is to put it at their level. We use cubbies that are low along the floor so she can have easy access to toys and books. Some of the cubbies have light baskets or boxes so she can easily take out or put back the bins and carry them to wherever she is playing in the house. This helps when it come to clean up time too. Another fun thing is to create labels or use stickers to indicate what is stored in each box. What kid doesn’t love stickers? When it comes to kids clothes organization is a huge sticking point. Fortunately, there are many many options depending on your child’s messiness levels and space available. Cubbies are great for clothes if your child is better with folding or if your kiddo is still small and not able to reach hangers or higher dresser drawers. Keeping folded clothes in cubbies as opposed to drawers make it easier for children to see their favorite clothing items, which is important for the kids who are learning to pick out their own clothes and dressing themselves. I’m sure you know what it can be like when you pick out the wrong shirt for them! If you have a closet and if your kid doesn’t mind hanging up clothes (somehow mine LOVE to hang clothes up) that is a great way to store outfits so they are off the ground and visible. If your kiddo is still a toddler, consider having 2 rows of clothes by simply adding another tension rod in the middle of the closet. You can keep their most commonly worn or favorite outfits down below and fancier clothes, seasonal outfits, and clothes that don’t quite fit yet on top. Get a step stool so they can reach both rows of outfits! Having control over their choice of outfit can really make your child feel empowered. If you have additional items to be stored that do not have to be visible or easily accessible, consider under-the-bed storage. There are so many different options! If you want easily accessible storage, look for drawers that can be pulled out. Many stores carry drawers with options of a cover or no cover, depending on what you are storing. This would be a great idea if your child “cleans their room” by stuffing all their things under the bed. The biggest hurdle with organizing for your child is getting them to take the reins when it comes to maintaining and organizing their own space. This is usually an ongoing struggle and learning process for both children and parents! Don’t shy away from talking with your child about where they keep their toys and how they keep their toys. 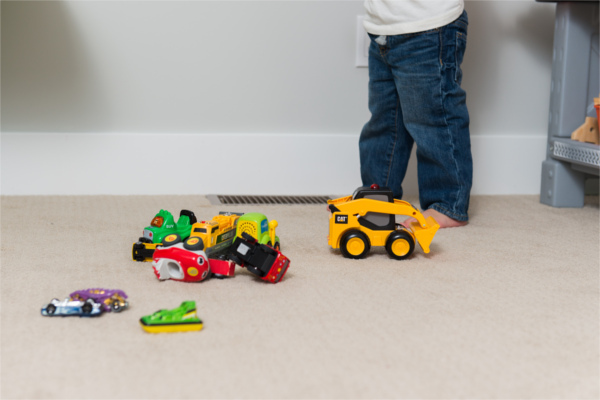 Children love making decisions for themselves, so allow this organization journey to be an opportunity for them to make choices about their room and their belongings.